BOOK I. JUDEA A VASSAL STATE. Chapter I. Under Persian Sway. Political Silence — Religious activity — The Bible Canon. Notes: Persian influence — Judaism as law — Bible books. BOOK V. SHEM AND JAPHETH. Chapter XXXVIII. 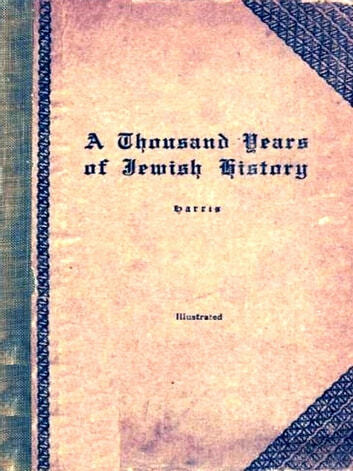 Beginning of the Jewish Middle Ages. In the Byzantine Empire — Laws of Justinian — Jews again involved in war — Rome's successors — Italy — The Popes — Slavery and trade. Chapter XXXIX. In the Spanish Peninsula. Gaul and the Franks — Vicissitudes in Spain. The land and the people — Arabian Jews — Jussef the Proselyte — Samuel the chivalrous. Chapter XLII. Islam and the Jews. Christianity and Islam — The Koran or the Sword — The Spread of Islam — Fall of Visigothic Spain. Rev. Maurice H. Harris, A. M., Ph. D.
Author of "People of the Book." "History of the Mediæval Jews"